Conditions that impact traffic affect the lives of citizens in a community. Foreknowledge of known road conditions can allow people to plan trips effectively, not only to their benefit, but to the benefit of the entire community. Road Work AheadTM is a set of applications that are used together to view, create & modify information about planned projects that affect road conditions made available on a real-time basis to the public over the internet. The end result is that related projects are more easily managed, hazardous conditions more easily tracked, and this information is easily relayed to the public in a form that is clear, readily-accessible and relevant to their geographic location. For additional details on availability and pricing, contact us. A map-centric web application enabling public users to choose a location and see the Events near them. Events are described in an attributes sidebar, and are determined by the extent of the map. 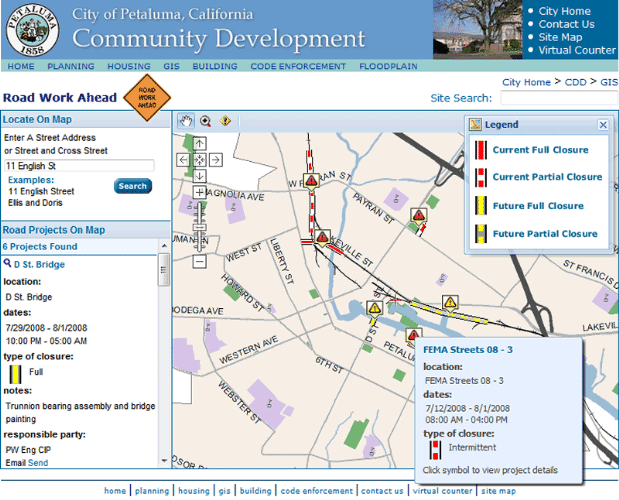 Users can pan the map or zoom in or out of the map, and the listed and shown Road Work Events that are displayed are relevant to the area shown. Displays Projects and Events that are currently active. New Projects can be created by clicking the “Add Project” button. Using the Viewer control panel, Projects and Events can be listed by any combination of the available criteria. Any Project or Event can be examined in greater detail by clicking the View icon, which opens that record in Project Data Entry. Displays information about a specific Project, the Events that it contains, and the Street Segments for each event. Events can be added or removed from the Project on this screen. Street Segments can be added to or removed from Events on this screen. Information about preexisting Events and Street Segments can be modified as well. An Interactive Map provides both a visual reference for the area of the Project, Event and Street Segment which is selected, and the primary method of adding new Street Segments to an Event. All three applications provide the ability to view data. However, Project Viewer and Project Data Entry require logins which are enabled for editing capability in order to add, delete or change any information. Users without editing capability can only view, and not change, using these applications.